Feel free to discuss any details about the hedge trimming procedure with our employees. They would be delighted to create beautiful shapes in accordance with your preferences. Under no circumstances will we leave clutter after the trimming procedure. Rest assured that the pavements will be swept and the garbage carefully disposed. Your garden will look neat and clean. Bush and hedge trimming is recommended once or twice a year in order to keep the initial aesthetic shape. You can rely on our professionalism and efficiency all year round. Whenever you notice that your trees and bushes are obscuring your windows or doors, just give us a call and we will promptly get the things handled. As we have mentioned above we can create specific forms of the bushes as a compliment to you and your guests but if you want to make sure that our technicians will perform the procedure exactly the way you want it, you can stay with them while the hedge trimming process is taking place. They wouldn’t mind to work under your supervision and convince you of their knowledge and dexterity. 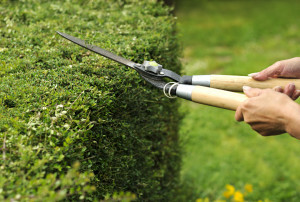 Hedge pruning and bushes require special attention and particular skills in order to look flawless. Our employees are aware of the proper treatment of any kind of trees, hedges and bushes. Leylandii and Fem, Beech, Laurel and Privet, Roses, Wild cherry, Wisteria – they are all tricky and their maintenance can be pretty challenging. However, they don’t pose any difficulty to us. We will help them flourish and bloom or stay green during all seasons. Just imagine having a neat garden all year round. We use the latest equipment during the pruning and trimming procedures and the best of all is that the clean up will be performed by our operatives in an environmentally friendly way. It has never been easier to avoid having shabby and overgrown hedges. Just contact us and enjoy the attractive shapes we create for your delight.